Manchester, NH (Tuesday, October 1, 2013) – With its new partnership with Vittoria Industries North America (V.I.N.A), The Bike Cooperative has added some of the world’s most respected and accomplished brands to its stable of supplier partners. 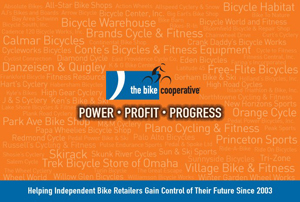 Effective immediately, The Bike Cooperative’s member retailers will earn rebates on all purchases of Vittoria, 3T, Geax and Selle Italia products and receive additional incentives, including stock rotation, exclusive group buying discounts, and 60-day right of first refusal on all closeouts and specials. Since 1953 Vittoria Industries Ltd. has built highly reputable partnerships within in the cycling industry and created a unique brand image. Today’s Vittoria Industries Ltd. is the world’s leading manufacturer of bicycle tires, with an annual production of more than 7 million tires and 900,000 famous tubulars and cotton tires. The group owns two brands: Vittoria for road tires, GEAX for MTB and trades several third party brands in some countries (3T, Fox in Italy; 3T and Selle Italia in the US).